We’re a bit stuck this weekend. The white stuff came down constantly in central London yesterday, and whilst it made very little difference to life in town, it put me off going down to the coast on our reliably unreliable trains. We’ve also had to cancel birthday party no.2 as the Cotswold hotel we booked is now only reachable by four wheel drive. So unless we wish to take our life into our own hands, it leaves us little option other than to stay put and enjoy the freedom of an empty diary. It has taken six years for me to stop going into a futile panic over the prospect of frost and snow. I have learnt that if one chooses to grow tender plants, then one has to live with the consequences of cold. I have never been one for wrapping things up in straw and fleece, which is far too unsightly in a small garden and, dare I say, too much like hard work. I’ve also learnt that many of the plants we grow are relatively un-phased by a cold winter, including Echium pininana, Agapanthus africanus and Isoplexis sceptrum. Fair enough, they can take a while to regain their former glory, but it’s worth it for the satisfaction of getting them to flower the following year. However Geranium maderense hates the snow so I hope they do better sheltered under an evergreen tree. If not, I’m afraid we may have to say “Adieu” until I am foolhardy enough to try them again. Everything else, such as the Canna, Eucomis and Hedychium (ginger lilies) are tucked away in a dark but dry cellar where they should be reasonably safe. What’s happened to the Mandevilla that I shoved unceremoniously into the shelter of a wall covered in Trachelospermum (star jasmine) is anyone’s guess. But what will be will be. Nothing I could do now would make a great deal of difference to the outcome, so I may as well get on with reading a book and pouring another G&T. 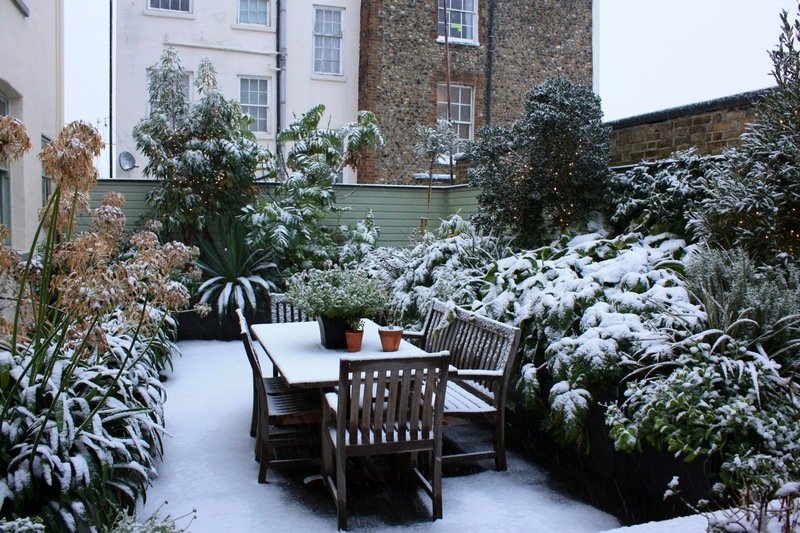 Above, our coastal garden lightly covered in snow back in 2010. The Geranium maderense didn’t survive. 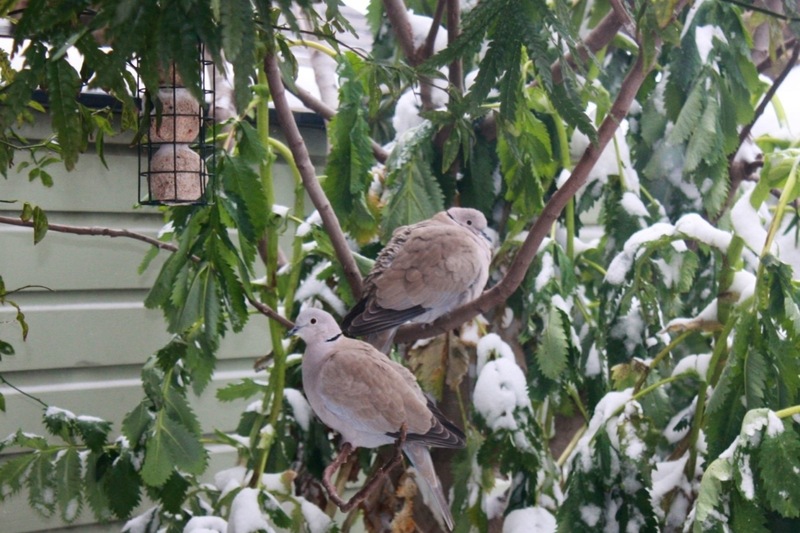 Below, our resident collared doves, Daphne and Dudley, take shelter during 2012’s cold snap. I’m pleased to report they’re both going strong. I totally agree they have to tough it out. We lost our isoplexis a couple of winters ago which was very sad but it left a lovely space to fill Only a couple wrapped in our garden and only because they have got too big to dig up and bring in and I feel a bit guilty – sparmania and a tibouchina. Enjoy your weekend! Ooo! Sparmania outside. Never considered that. Ours is indoors and not looking awfully happy about it. I think I’ll have to cut it right back and let it regrow from the base. Hope you’re not too chilly down there in Devon?